Therapeutic Moonbeam Catcher – Snake Oil For The Space Age? | OhGizmo! Therapeutic Moonbeam Catcher – Snake Oil For The Space Age? Richard Chapin originally made his fortune as the founder of a lucrative Arizona swap meet but these days he’s invested some of that money (about $2 million) into the world’s first therapeutic moonbeam catcher. Hmmm… The Interstellar Light Collector as it’s called is basically an array of 84 mirrors mounted to a giant arm that can rotate 360 degrees. 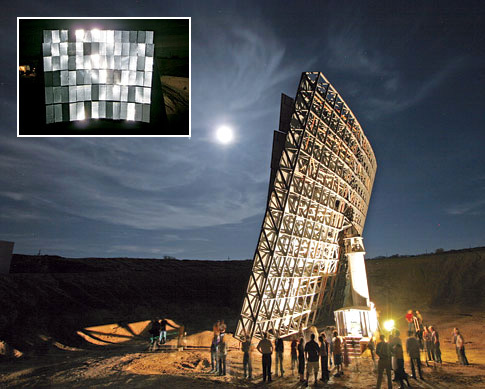 The mirrors can be individually adjusted to focus the moon’s light (which is actually light reflected from the sun but with a unique frequency and spectrum) to an area as small as a person’s head. Nothing too innovative so far but what Chapin claims the collector is capable of will raise a few eyebrows. You see he believes his invention can help people deal with depression and conquer arthritis or some types of cancer. I like to keep an open-mind when it comes to scientific research since some of the most important discoveries of our time weren’t found in a laboratory setting but I have to admit I’m not exactly convinced here quite yet. Thankfully at the moment it doesn’t seem as if Chapin is actually charging people for a ‘moonlight treatment’ nor is he guaranteeing any cures so it will be interesting to see what his research finds… if anything. Prozac (fluoxetine) for Depression: It really does help. I have been on it for 20 years and have tried other medicines but they never worked and I just always go back to Prozac.